The Internet is the best resource to add people to people. Every country is upgrading internet connectivity and speed day by day. Some countries are very slow in up-gradation. They are also working on the latest network, Services, speed through the support of local companies. Now the world is totally connected. 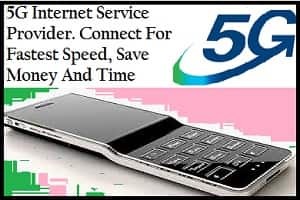 The country is waiting for 5G internet speed for a long time. The work has been started and the government targeted to provide the 5G services to users till 2020. They are working on the execution of strategy on a priority basis. The government has organized a group of companies, they will submit the report in the coming days. This group will start the 5G services in India as a pilot project. The best they will do and serve. This group will consist of the expert in the telecom field as well as business houses. Those who are involved in this venture are - CEC of Bharti AirTel, Reliance Jio MD and another representative of Internet companies. The Chairperson of the group is Telcom Secretary Aruna Sunder Rajan. This group has started to prepare the roadmap of 5G from September and are working continuously. This step will give the opportunity to the government to bid 3300-3400, 3400-3600 megahertz spectrum band. This spectrum is very important to start the 5G network. The network speed is the sole of the Internet. Every user wants to get the maximum speed of the internet to save money and time. The best speed attracts customer instantly. This 5G network is the wireless technique for the next generation. This has the big capacity to transfer the data with the help of 10GB per second high speed. This has the capacity to add a million apparatus in the single click. 5G Network will reduce the cost of transfer the data. 90% reduction will be there. The big impact and revolution are coming with a 5G network. You can use the service to save money and time both. The number of companies is waiting for 5G network services. They want to provide the latest technology and fastest speed to internet users for business purpose. The companies are Avi Ericsson, Orange SA, Verizon Communication, Google and Samsung Electronics. These are the best five internet provider companies. Below are some important points shared by you. The best information is that the governing body is very much eager to start this project. But they are also working on infrastructure too. The new generation will use this facility to improve connectivity at the lowest cost. They will use the internet to connect himself form the world. Share your opinion on this post. Drop your query and comment in the below-given box to improve the site content.